Well, the European gossip mags weren’t lying this time about Princess Caroline of Hanover (and Monaco) becoming a grandmother. I mean, they couldn’t be making stuff up with photos like these from Celebitchy last July, 2012. And that’s not a pillow strapped to the woman in pink to scare Princess Charlene on purpose. 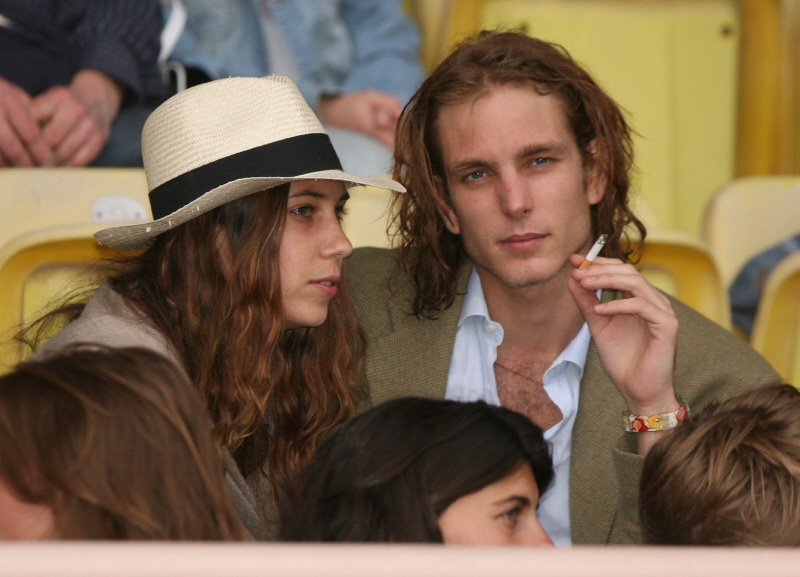 Well, the baby was born March 21 and it is a boy, Sacha Casiraghi. Naturally, the pair were excused from attending the upcoming Rose Ball, which raises funds for the Princess Grace Foundation, because of the birth. But the wedding is definitely on track for this year, although no date has been officially set. Now that the child is born, and it is providentially a son, the royal grandmother is counting on it. A baby mama Tatiana is not. Not to this heir-crazy royal family. Princess Caroline’s press office confirmed the news via a statement. “Her Serene Highness Princess Caroline has the pleasure of announcing the birth of her grandson, born on 21 March 2013,” the missive said before adding: “Both mother and baby are doing well”. And just who is Tatiana Santo Domingo? She is the daughter of one of the richest men in the world, Julio Mario Santo Domingo, Jr., and is a scion of the Santo Domingo media empire in Columbia. Her mother is a former Sao Paulo socialite, Vera Rechulski, who currently runs a Paris boutique. Tatiana herself runs a business called Muzungu Sisters, which she co-founded with business partner Dana Alikhani, daughter of the late Iranian businessman Hossein Alikhani, to promote fashion sustainability, ethical fashion, and to help Third World artisans (like small coffee farmers and cooperatives) sell their jewelry, purses, clothing and other accessories and designs at a fair price. She and her younger brother, Julio Mario Santo Domingo III, stand to split a $6 billion dollar fortune. She was raised primarily in Switzerland and France. It’s said that Tatiana met Andrea Casiraghi when they were attending the same lycée (school) as children in the exclusive Paris suburb of Fontainebleau. Another story has it that his sister Charlotte Casiraghi introduced them, not just “mutual friends.” Officially, the couple have been together for eight years and were only engaged last year—after Prince Albert and Princess Charlene had married. Nope, they’re not going to set up shop in the royal palace. Andrea, like his late father Stefano, has the occasional need for speed, and in the past, has gotten into tussles with the press, and in and out of bars and restaurants. There’s been persistent rumors that Andrea has used hard drugs. However, all this seems to have been a phase; Andrea appears to have stabilized with this young woman. Result: these are some relatively quiet royals. ,As Andrea and Tatiana were not necessarily raised in the public eye, neither will their children. Not until they are of age, so they will have some kind of private life. The new parents are boho spirits who are happier soaking up the sun on a beach in Ibiza than holding court in the Grimaldi clan’s stately 13th-century palace. Their engagement announcement, a simple communiqué from Caroline’s office, lacked even a mention of the pregnancy. Moreover Tatiana, the granddaughter of Colombia’s second richest man, resisted the temptation to be seen flashing a princess-worthy rock. So how will the scion of the two high profile dynasties be raised? Andrea, 28, and his 29-year-old bride probably won’t settle in Monaco. Instead, the family base will be in Paris away from the media spotlight, with regular forays to Rio de Janeiro, the home of her mother Brazilian socialite Vera Rechulski. Even in a public setting like Paris Fashion Week, Tatiana can’t understand the stampede to get her picture. “I thank goodness there can’t be any celebrities left,” she once quipped. For being so privileged and rich, Tatiana hates fuss. So there will not be an outrageously spectacular christening ceremony with four bishops and 15 priests along with the incense and holy water as with Princess Caroline in 1957. (It also pays not to kick Princess Charlene in the teeth with that kind of thing) Instead, the child will probably wear the traditional royal christening robe and the family will assemble in the cathedral or royal chapel along with Andrea and Tatiana’s friends, some of whom will probably stand as godparents to the little boy. And it will be a semi-private affair. 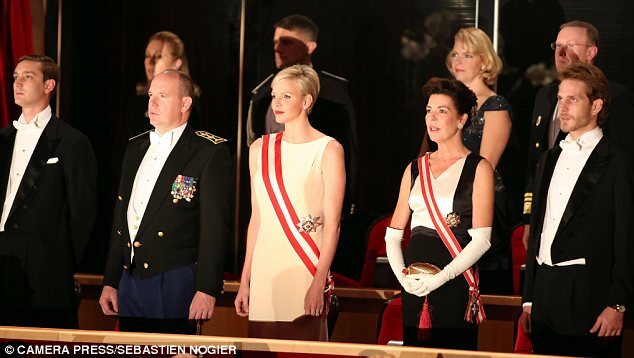 Now, there is even more pressure on Princess Charlene to produce the heir, preferably a male heir. Frankly, I wouldn’t like to be in Her Serene Highness’ shoes for anything. She cannot survey these developments with a sense of ease and confidence in herself and in her marriage, and with this family, she needs all that she can generate. More, I think, than when she was a competitive swimmer. I think Princess Charlene’s going to have to relax…and think of Monaco. ~ by blksista on April 12, 2013.